The first-year Phantom has been on a bit of a roll lately. Following his fourth season in the OHL that saw him don the “C” for the Kitchener Rangers as he led them to their fourth consecutive playoff berth, and all the way to game seven of the Western Conference Final, it was time for that chapter of Connor Bunnaman’s career to come to a close. Now, the Flyers’ 2016 fourth round draft selection is in the midst of his first season in the AHL and, after somewhat of a slower start, has shown that he can cash-in on big opportunities once they present themselves. But back to the beginning, getting yourself accustomed to pro hockey is no easy task for any player coming into the league out of major junior or college, and Bunnaman has had to work through that adjustment period just the same. While still becoming acclimated to the different aspects of the league, Bunnaman had been a part of what was referred to by many as the “rookie rotation” between Bunnaman, Carsen Twarynski, and David Kase. And not only was he being rotated in and out of the lineup, he had also been playing all three forward positions, something that was not exactly new territory for him after having his position “switched a bunch” across his four seasons with Kitchener. What has never changed is where you tend to find him while watching him play. When you find yourself taking in a Phantoms game there’s a good chance that you’ll find Bunnaman planted right in front of the net, and that’s no coincidence, that’s by design. Listed north of 200 pounds and anywhere between 6’1” and 6’3” depending on where you look, Bunnaman has the build to be that powerful, net-front presence player. That havoc has led to four power play goals so far this season, all of which coming from just where you’d expect them to, right in front of the net. His focus on getting to the the net isn’t isolated to only the man advantage either, as through the first 35 games of the season there’s a case to be made that Bunnaman has been the team’s most dangerous shooter, based on where the majority of his shots have been taken. If you’re someone who follows the Phantoms closely, you’re probably thinking to yourself, “no, Greg Carey is the team’s most dangerous shooter, he can beat a goalie from almost anywhere on the ice” – and in that sense he is, we’re in agreement there. However, if we’re to look at the most dangerous shooter in the sense that it’s the player who’s shots have the best chance of becoming a goal, based only on where the shots have come from, along with a few modifiers like pass types, that player has been Bunnaman thus far. Through his first 26 AHL games, 38.89 percent of his shots taken at 5-on-5 qualify as high danger, a figure which puts him first among all Phantoms’ skaters, and well above the forwards’ average of 25.46 percent. But hang on, if his shots really are as dangerous as being suggested here, why is it that he’s scored just four goals at even strength so far this season? Well, a lot of that has to do with his ice time and role. Along with having missed nine games as a healthy scratch, his estimated average time on ice at 5-on-5 currently sits at 11:31, the fifth-least among skaters having appeared in at least ten games this season. To put that into perspective, his estimated average time on ice is just one second shy of Michael Raffl’s in Philadelphia. And, not dissimilar to Raffl, his early-season role was primarily a checking one, and it wasn’t until Phil Varone’s call-up to the NHL in early December that he found himself a part of the top-six. Since December 7th, the day of Varone’s recall, Bunnaman has primarily centered Carey and Aube-Kubel, with Kase, Chris Conner, and even T.J. Brennan for a game — yes, the defenseman, that’s no typo — also seeing shifts at right wing on what has been the team’s top line. It’s no secret that things are a bit different when a player is placed in such a role where you’re expected to consistently produce offense. You have the ability to be a bit more creative in your time, and it’s a spot that he’s thrived in. 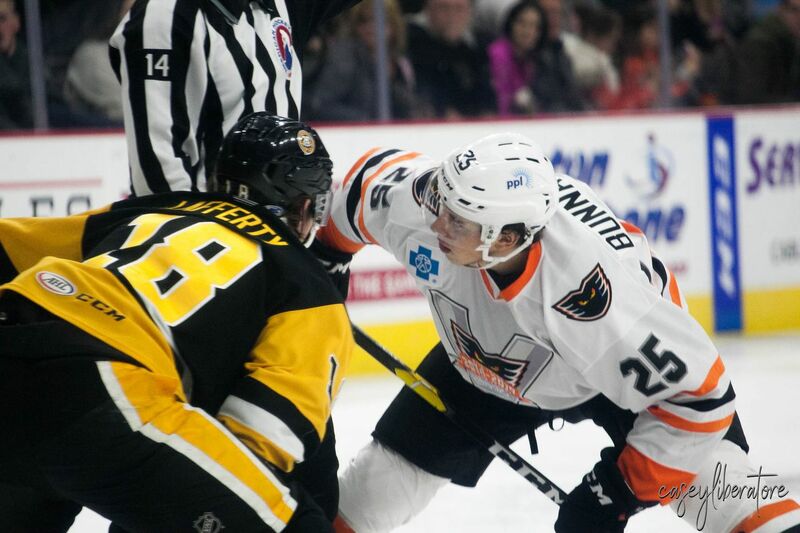 More recently he’s centered Twarynski and Leier, as the team’s lines had been rearranged in the middle of their road trip amidst the Phantoms’ three game skid. There’s still a big chunk of hockey left to be played, 41 games to be exact, and for Bunnaman the short-term goal in mind is simple, just a desire to continue to improve his game further. There are already a good amount of positive signs for the Guelph, Ontario native through the early stages of his rookie season, and even more numerous building blocks that lay a solid foundation for him to build upon on his way to eventually reaching the big stage one day. Previous Post Live free agency updates: What’s the latest on Bryce Harper, Manny Machado and the Phillies?